Being a ‘Springster’ is a mindset that can be shared by girls everywhere. It’s about being open to new ideas, curious about the world and ambitious for your future. It creates a sense of genuine community within the platform, giving isolated girls a sense of belonging – and the confidence to fulfil their potential. To appeal to girls all over the world, we took inspiration from the one borderless language people can all relate to – emojis. As well as developing a unique set of Springster emojis, we created the Springster Hey – a universal, welcoming gesture and a powerful symbol to unite girls everywhere. Identity elements. The hand animations at the end are great. While the name, logo, and identity are new, the mobile platform existed previously and used the Girl Effect name and look and since that is still active, we’ll move right along to the new stuff. The name is short and fun, although I like it better if I think of the platform being the “springster” vs. labeling the users as “springsters” — my mind keeps thinking of teamsters. Still, I’m not the target audience so that’s not necessarily a critique that applies to the context. What I do love all the way are the hand icon and script wordmark. Hands are hard to do as logos but this one is abstract and playful enough that it can get away with some of the general awkwardness of drawing hands — one minor quibble is that perhaps the point where the thumb meets the hand should have a flat ending like the other fingers. The wordmark is fun and bouncy (although, also and perhaps, it could somewhere repeat that hard angle from the hand for better integration). The identity elements all stand out from recent trends as well… like the illustrations that are not simply single-line drawings but actually have textures and colors or the complementary font that’s not a straightforward geometric sans serif but instead it's a slightly awkward condensed sans full of personality. Overall, this feels well thought out and incredibly appropriate for the audience. \"Springster is a global mobile-first platform which builds vulnerable girls' confidence and skills online to help them fulfil their potential offline. 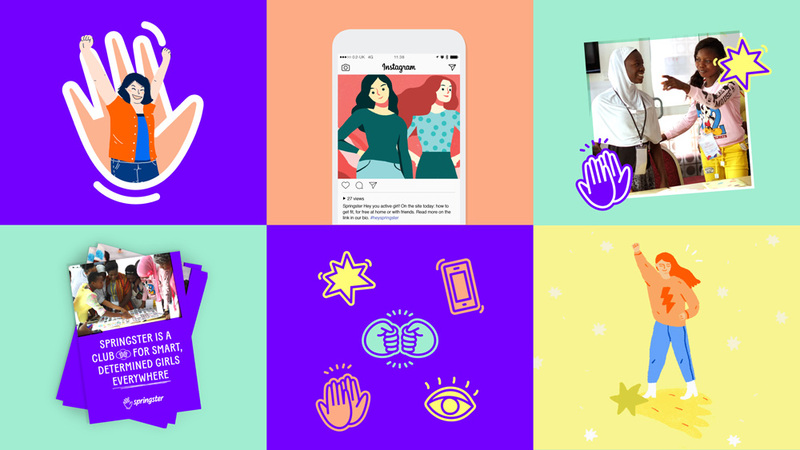 One of Facebook Free Basics' top five most visited sites, Springster celebrates the diverse, inspirational and convention defying experiences of girls through entertaining and educational content and stories written for and by girls. Springster helps girls find meaning and strength in each other's experiences. In so doing, it creates positive change in girls' lives by building their knowledge, resilience and self-belief. By tracking real time usage, comments and user engagement, Springster uses a new impact methodology to measure how online behaviour can shape offline action and lead to shifts in girls' knowledge, attitude and behaviour. Our vision is to enable 100 million girls to find their voice online.\"